You are here: Virgin Islands News Online » News » Who will it be: Ronnie or Myron? Who will it be: Ronnie or Myron? ROAD TOWN, Tortola, VI - With Premier and Minister of Finance, Dr the Honourable D. Orlando Smith (AL), out of the race for Presidency of his ruling National Democratic Party (NDP) and the upcoming General Elections, the political landscape is now wide open. A recent poll conducted in the Virgin Islands (VI), by the Barbados based, Caribbean Development Research (CDR)—owned by Peter W. Wickham—showed Dr Smith, was still the preferred leader of the Territory. 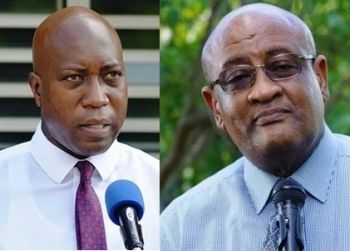 With him out the race however, a ‘dog-fight’ has emerged between two Cabinet Ministers—Health and Social Development boss, Honourable, Ronnie W. Skelton (AL) and Hon. 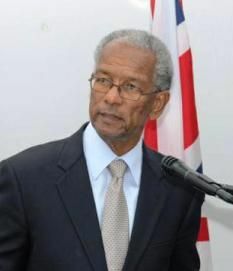 Myron V. Walwyn (AL), the Minister for Education and Culture. Political observers and NDP Delegates have told our news room the revised Delegates List, is now stacked in favour of one of the two candidates. Our news room cannot as yet, independently confirm the accuracy of the revised ‘List’ just obtained by our news site. It should be noted however, Candidates can also be nominated from the floor, at the June 23, 2018, NDP Convention. Supporters of Hon Skelton, say he is a stable force and can keep the party factions together—the Clines-Pickering-Turnbull, Penn-Crabbs to name a few. They claim too, mismanagement of government funds will not be allowed under Hon Skelton who will be the Minister of Finance, if his party emerges, as the winner. His critics contend, while he has stature and is a stable hand, he however, “is not down to earth and does not go to the rum shops”. As for Hon Walwyn, they said, he has the support of the young people along with the Caribbean brothers and sisters eligible to vote. Should he win however, the party will split and some elected members will not run again, they claim. Thus far, both sides claim they have the numbers to win, however, from all indications, Hon Walwyn, still appears to be the front runner, but the race has tightened. Whoever emerges as the winner could also serve as Premier, should the NDP win the next General Elections but what is clear, they will face a revitalised Virgin Islands Party (VIP), under the Leadership of Honourable Andrew A. Fahie (R1). At the end of the day we have to remember that this should not be a popularity contest. We are in the dumps right now and need solid people of stature, not rumheads and dummoxes. We also need voters who have the Territory at heart and not those who are grabbing for trivial handouts. People who will not sell this Territory for thirty pieces of silver. Which of our great leaders of the past were frequent patrons of rum shops? These are serious times, people. We need to get real. @ Ok Now Well perfectly said. This ain’t the average things where we vote on popularity instead of who actually did the best job. This is about the children who’s now 3 of age, and their children’s children. We have to acknowledge there’s a hugh shift of how it uses to be and how it is now and what’s possible for tomorrow. We can only hope for the positively best. CAPOONS BAY SCHOOL. ESHS. CARROT BAY SCHOOL..... Our children still working out of tents - nearly 10 months on from the storm. Misspent funds. We cannot put this man in charge of our country. Nothing wrong with being accessible some people should try it! Our snot nose politicians only represent the rich and elite. Unless your in a certain circle they don't want to see you. Myron always in the trenches in the streets because that's how you know what people going through. Keep off our boy mehson! What Ronnie said/did under his portfolio that added value? The damn Coxheath situation is enough to toss him in the same pile burning & burning! The hospital was a fleecing and so too is his NHI scam! I had hoped that at least Alvera would have came forward as a challenger....or some other female from the party! Both are not the same. Ronnie is more fiscally responsible with money and that is what we need right now. He is one of the few Ministers for Finance who actually balanced the budget and was responsible for a surplus in the Treasury. In addition, he is less likely to sell out the country. I am disappointed in Dr. Smith for not endorsing Ronnie. If Myron wins he will be in a party with himself and Mark. Skelton , “His critics contend, while he has stature and is a stable hand, he however, “is not down to earth and does not go to the rum shops”. This is insulting. The VI electorate is more mature and is beyond people thinking they buy their votes with a drink ah rum. The VI electorate want to hear about and discuss kitchen table issues, ie, economy, education, health, skyrocketing cost of living, public safety, rising crime......etc. Walwyn, “They contend, Mr Walwyn, is the type of politician who can be seen “at the rum shop buying rounds” and “lives on the streets… he has never stop campaigning since 2010.” Campaigning all the time is smart politics. But hope that buy rounds in the rum shops is not to buy votes . Electorate are more mature than this. If the electorate wants more (respect), they must demand more; they should not let themselves be insulted this way. Then again perhaps they are taking the politicians money and vote their conscience. Are you saying that the minister of Education has not out performed the other politicians in the years he is in office? Are you saying that the BVI electorate are soo dumb that they could be bought with a round of drinks? Well my estute friend Political Observer (PO) .Your comment is disrespectful and belittling to the BVI electorate. At the rumshop.....well ofcourse he owns quite a few of them in the bvi. Rum destroys lives but hey nothing is wrong with buying the rounds right? Myron got this. Maryland crab cakes, fried soft shell crabs and Coors light we are going to celebrate with when he win. Come on Fararra.....we need you now. Jah wil never give the power to a bald head. Time will tell. Something fishy is going on in the Virgin Islands. The real danger is still a hidden hand. Don't let us have to deal with it, God knows we will. Ronnie has a stable hand and is the more experienced in international affairs. We are in a very unstable situation at this point and we need the stability to see us through. He is not a willful spender and he has the know how with financial services. The Premier took him with on his BVI/Asia Mission and that speaks volumes of the confidence to assist in that area. Wallwin rip us off with the high school wall with thousands overspent and the unnecessary expensive trips around the world that nothing came out of. He using that same money to bribe man with rounds of drinks. Is that hungry for power??? He mashing up the party and he like to victimize bvi people who don't support his ideology. No way can I support such an evil villain. Ronnie all the way! Not to be disrespectful towards Hon. Myron Walwyn but I see an enlarged ego which needs to be fed with power. I might be wrong and excuse me if I am. My understanding is that Hon. Walwyn micromanages his staff which is an indicator that he doesn’t have confidence in them. A leader should be able to delegate and allow his staff to function at their full capacity. This is the sad reality of politics. It's created to divide. It compelled you to choose sides. These candidates are colleagues and have to work together regardless who is triumphant on Saturday. So it's very disheartening when I read all these vicious post about the two forerunners it very malicious and works against the entire NDP supporters. This has to be people who wants to murky the waters. But our BVI populace are a smart people and can see through the rhetoric. I think all politicians need to hang out with the average man and see for themselves what is going on in the territory. A lot of people suffering, a lot of people homeless, and yes, it got people hungry. To know how the people feel you have to mingle with them in their own comfort zone, whether it's a Rum Shop, Barber Shop or Corner. Politician need to understand how the people feel and what the people need and what the people want. While I might mingle with people at a rum shop, I will not condone rum drinking by buying rounds. Ronnie is a bit stuffy and boring. Myron is more outgoing and reachable. Why aren't our comments not getting posted? This choice is simple if the symbol of the NDP is still the family. The National Democratic Party started out strong under the symbol of the family. Strong family values was it's strong focus point. Is this still the case? One candidate defintely represent strong family values and this can't be said of the other. Rum consumption is helping destroy BVI families as is extra marital affairs. The Choice is Crystal Clear. A good political leader is someone who will be honest and responsible for their own actions and decisions and who is willing to admit when they have made a mistake. They will focus their energies and time on representing the people rather than spending all the time “covering their backs” and criticising others. This Rum Shop politics referenced here omits 50% of the population who are (VERY generally speaking ) infrequent patrons....WOMEN. Where is the informal forum for women to have an input? When will the Cabinet reflect the population and be comprised of 50% or more women? Where are our women leaders? I'm ready for the shift, the time is now. Where is that noisy lady who is always speaking for the people on facebook? Is good for the soul you dont know what might come your way victory or failure.Buying votes aint nothing new and it will continue even when we leave this world but why sell your vote for just one day then lose your soul and gain nothing at all. Not even the future of your generations to come?The BVI needs a heavy cleansing let the holy spirit come fill this place to rid it of too much evil in all places not just with our mouths but truly and genuinely with our hearts.Too much greed and demonic wickedness in high places. Ronnie, Ronnie, Ronnie all the way!!! This is a great piece of political writing. So much innuendo but treads the line well. I can't vote, but would be uncertain as to which choice is better (other than on balance I have a inherent mistrust of small groups of families with last names controlling politics). Ronnie! He will be better fit. He knows finances because the premier portfolio comes along with finances. Myron is popular but this is not a popularity contest. Remember we have a financial issue right now. We need someone who is experience. So Mr. Skelton, one of the ORIGINAL members of NDP. Put in years serving and now it's his turn to lead the party but we considering JOHNNY COME LATELY? You all serious? I'm sorry but I don't need my LEADER buying me rounds of alcohol to go crash, the slander that follow their name makes you recoil. I simply need my leader to be approachable. Tell me the truth no matter how bad it is. Has the RESPECT ON HIS NAME for his actions and deeds. THAT IS WHO SHOULD LEAD THE PARTY. I will bet on Ronnie. What Myron has against him is that he is not deemed to Indigenous. That is the based for all BVI Islander. Ronnie yuh say?!? Lol! Wah bout all dem pieces of junk he geh we from ChiiiiiiiNA that are about as useful as the derelict vehicles being ‘sold as is’! Wah bout the fiyyah burning down west? Wah bout the millions and millions spent on the hospital and the length of time it took/taking to complete? Just please!! Compare what you listed that is wrong versus the good he has done in addition to his qualification to do the job. No person's tenure in government will be perfect. I am with Ronnie all the way! The frying pan or the fire? The devil or the deep blue sea? Neither of these two we hope. Walwyn has been the most connected and reachable minister that I have ever met. The other ministers have been in the cloud with just a cycle of good friends around them. Even the children can tell you that. Because I want to feel am up am the man and u still under me ,look at me am in control. I want the tax payers to pay for me to live in my own house, have a government SUV, a nice pension plan and other allowances. By the way I will not have access to any finances including donated money. The management group set up by the Governor which takes us back to 1949 must approve all expenditure. These are the reasons why I want to be elected to the House of Assembly. Ronnie is too quiet. He hasn’t stood up for anything useful yet. Integrity and accountability- has he filled in his register of interests? Has he tried to reduce the amount of money private establishments make from nhi? No? Why? I would rather see the man in the rum shop talking to people than the one up to no good with his rich friends behind closed doors. I don’t see Ronnie as a leader of the BVI - it needs change and someone who won’t sell us to the Chinese so their companies make money providing materials for the airport.